“The Four Seasons” – Story about a young servant girl and her English ex-pat employers and how the English community is faced with the war that they hadn’t foreseen. “The Moslem Wife” – I did like parts of this story of the relationship of two married cousins (and liked it better after hearing Mavis Gallant talking about it). “The Remission” – A very long story about an expatriate community on the French/Italian Rivera. It was okay but a little boring. “The Latehomecomer” – I didn’t have any idea that German prisoners of war were basically made into ‘slave’ labourers in France for years. “From the Fifteenth District” – This I found to be the most intriguing of the stories so far. A tale of ghosts haunted by the living. The concept is a nice twist on what we would expect. “Potter” – Another very long story which I found annoying because I really didn’t like either of the main characters. “His Mother” – This is one of the ones I liked the best of the collection. On the shorter side and giving a real snapshot as a mother of an émigre in an Eastern European city. Reminded me a bit of De Niro’s Game for some reason. “Irina” – Another of the shorter stories. I liked the ending & I especially liked the description of women as parcels. 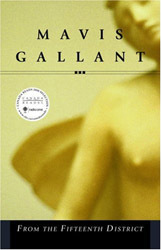 Overall, I really enjoyed some of Gallant’s language, especially her descriptive imagery, but since I found the characters and their situations kind of dull, I found it difficult to read. Perhaps these stories would have been better listened to than read—I find that with texts that have so little plot: I find it hard to concentrate on just the language and expression. I also found her characters and the stories blended into one another and were a bit ‘samey’. I’ve finally finally finished this neverending book! I read this book as an assignment for school, thinking it was a good choice because I’ve recently been enjoying short story collections. This is not the book to read if you enjoy short stories. I can’t possibly understand how this patchwork novel made it to CBC Canada Reads. A great waste of effort on Moore’s part.